Builds that I use frequently and/or are the main designs I use in CQ or FB. Short for High Energy Efficiency Test. Another alternate frame rethinking the traditional design to try to create a more balanced frame. This build combines pieces of different prototype frames I've tested in the past. There are a few parts in particular that differentiate it from my other frame, the first of which is the use of the FA-303. 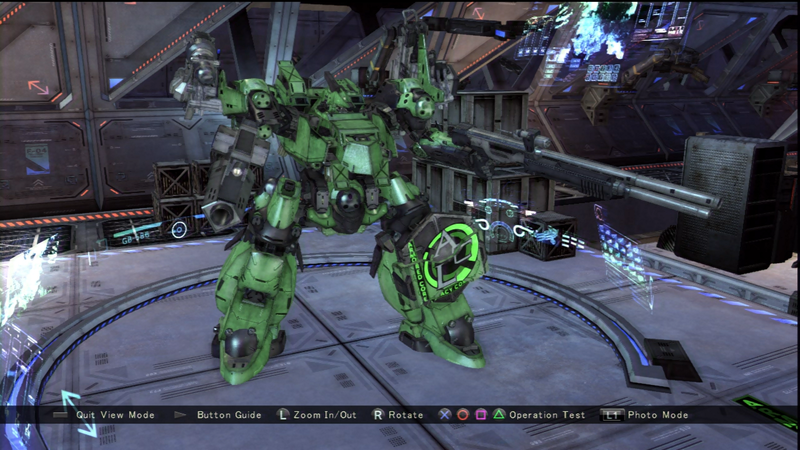 This FCS is basically a mini Otkryt with less range, so I had to figure out how to make this work. I added the Hd-U-C23 head with its great 966 Camera Performance which means I have a range of about 230ish. I also used super low drain arms. The Utsusemi arms have about 400 drain, three times less than a CE arm and half of a regular KE arm. They also have decent fire rate at about 149 at the cost of AP and defenses. 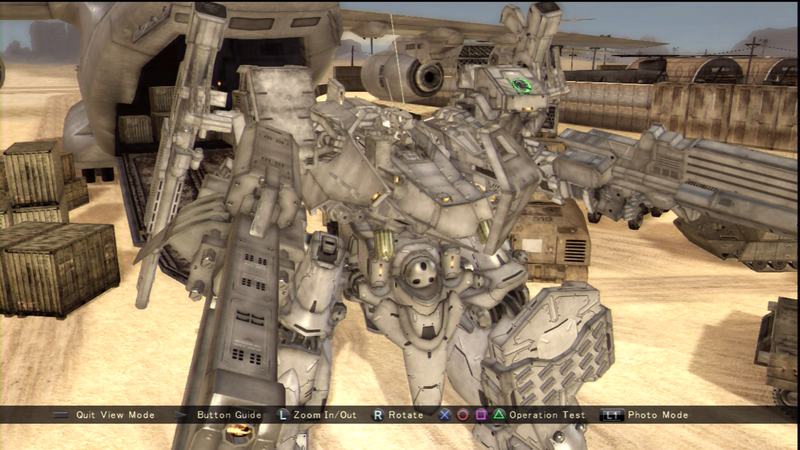 For this frame, I decided I wanted a balance of defense and AP, but it's hard to get with the the combo of the CE head and light KE arms, so I chose to only aim for buffing out the AM/RFA-222's 1426 KE attack power. To add more AP, I picked the CA-215 and the L2HA-307 Bingo which, although have lower defenses, have slightly more AP bumping me up to 33k. This with the overall higher speed/maneuverability and lower drain means that I have greater survivability than the standard frame. Weapon setup is still being figured out and I'm still experimenting around. 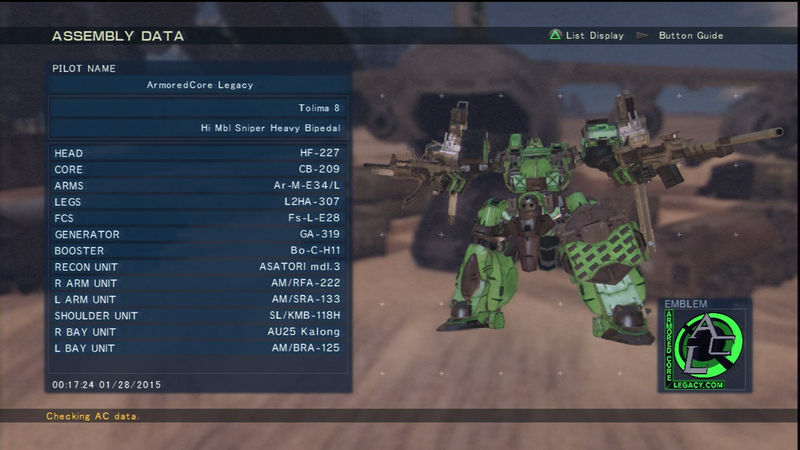 Overall, a very interesting build that comes close to the "ideal" Tolima design. It hits the theoretical speed threshold of 320 HB and has almost enough defenses with just enough weight capacity to hold it all. Builds that are designed around a specific strength or to test certain concepts. Builds that have been created that either did not perform well or were merely unique experiments. For the most part, they are meant only for practice or fun FB purposes. This one is more of a fun design that I created based on looks to make it badass. The KE shield is meant to help out its pitifuly poor KE which sits at 870, enough to make some shotguns do effective damage. I don't have any really strategy with this build, other than jump around and shoot people with the sniper rifle, and then with the BR and pulse gun when you run out and occasionally shot flash rockets. Defenses are 870/2123/2520. 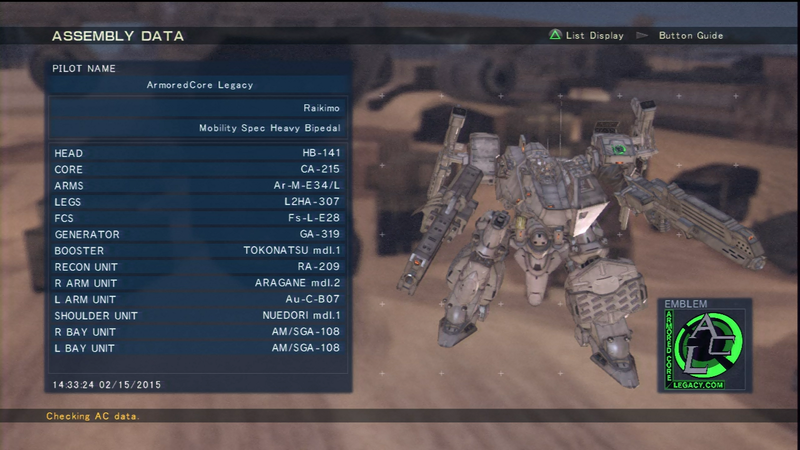 Concept build, pushing instead for KE and using the L2HA-213 legs (ULG-06). I fall just a tad bit short from blocking out a full power Tansy (Au-B-A17) but I like the look of the HB-141 head so it's close enough. Defenses are 1814/1173/2633 and AP sits at 37818. Consists of designs that used to be Primaries and/or are functional/optimal but I rarely use anymore. 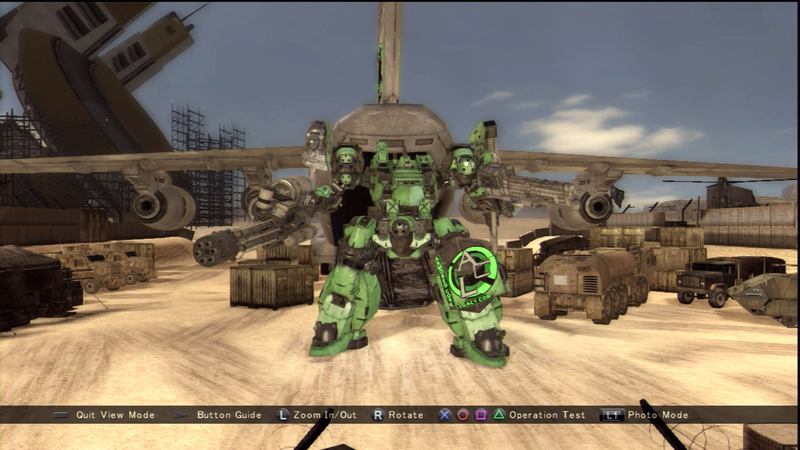 One of the first Tolima designs I built in VD, I modeled it after my original Proto-Heavy from V. Originally it had a laser cannon, shotgun, battle rifle, and physical blade, but I decided to revise it to more of a pop shotting role. I used the 8 shot SR with the new mini-sawa to give good damage output in two areas (and give me a greater chance of breaking shields) with dual shoulder ammo to increase how much ammo I had for both weapons. Currently my most used design, the Rolima series is a constantly changing AC that has parts switched out based on my needs. Originally it started out as a 1v1 build but I've been adapting it for better use in Conquest battles. It is a reasonably well balanced Tolima build that has well rounded defenses, weapons, and mobility, at the cost of low AP (about 30-32k). The picture above shows the Ver. 3 and 4 Model with ACL paint scheme. Defenses vary from 1477/1461/2396 to 1500/1645/2445 to 1523/1595/2486 depending on legs and arms used. 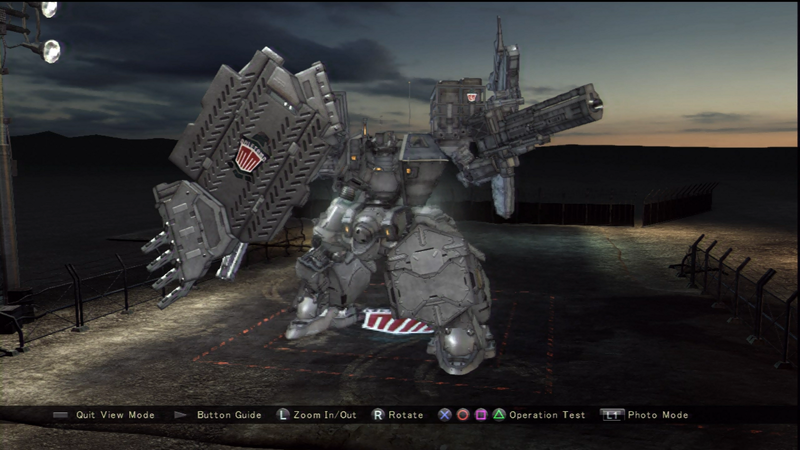 -The most recent setup I've started using and a variation of Ver.2 I've changed the legs to the L2HA-118 (ULG-05/A) for the weight cap and added a Plasma gun. 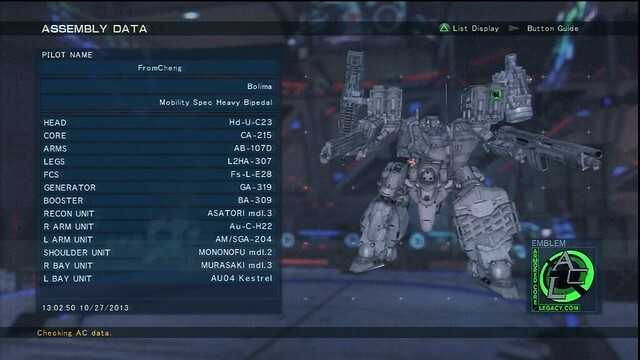 The Plasma gun was added to give me greater ability against heavier units with high AP like fortress quads and tanks, and as a added bonus, I can use it as a CIWS in emergency situations where I have to fight Missile weapon arm users. It's not quite as able as a PMG, but it works, and I can shield fellow ACs as well with its large area. 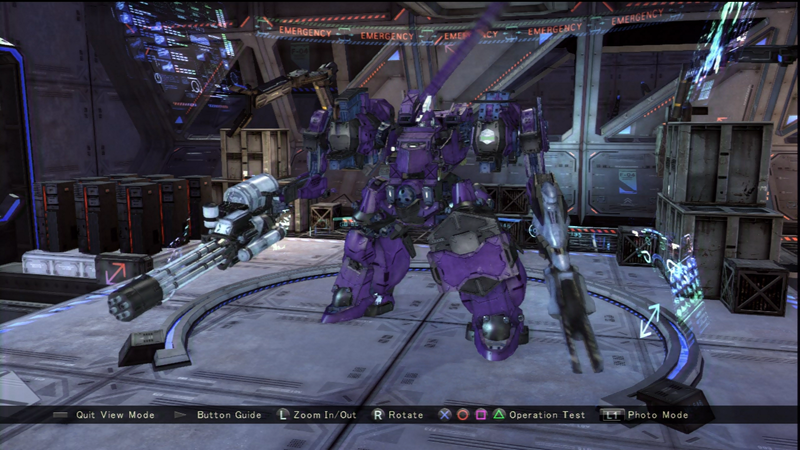 I switched back to a rifle to give me some quick damage output be it ineffective or effective. 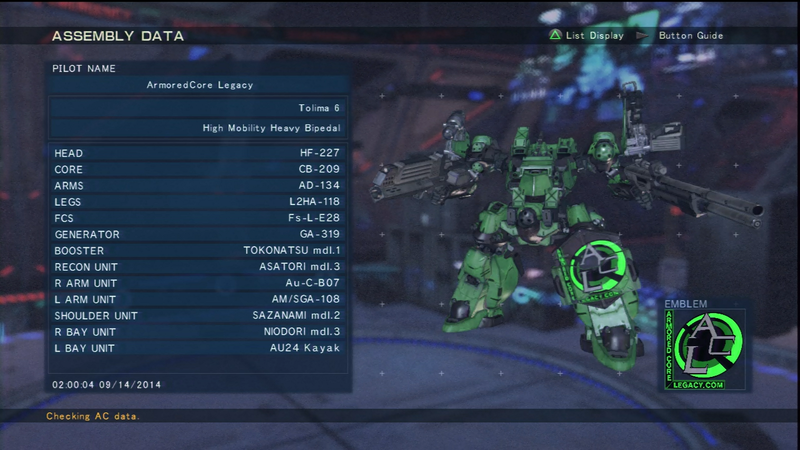 High speed missiles used for its general overall good stats, and the Cycad over the Zlatko due to ammo. -Variation of #3. I have repicked weapon setups to focus primarily on high burst damage. Triple BR+howie pairs well and provides good coverage of defenses, while the TE missile has been picked as a result of dropping the plasma. The Sniper rifle/rifle has been retained. 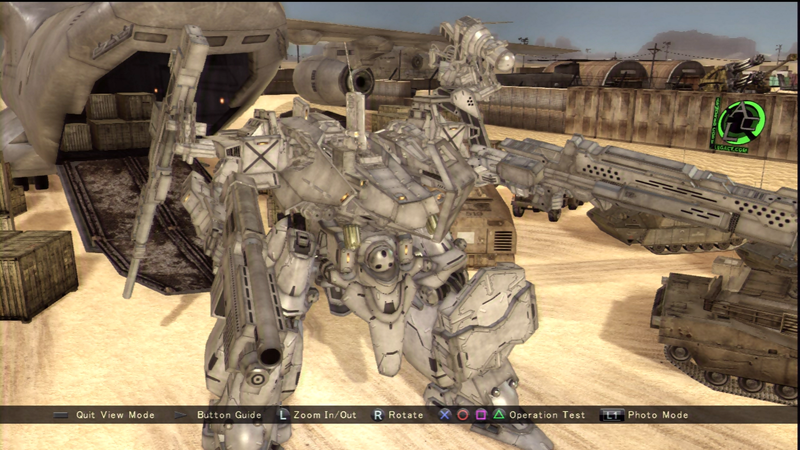 Prototype AC that use the single shot sniper cannon. 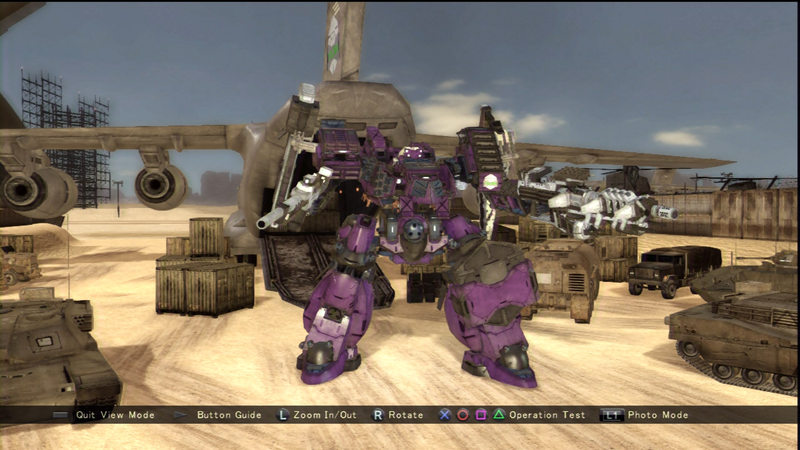 Its fast firing speed and ability to wield them on non-tank legs allows for greater flexibility than a traditional sniper cannon tank, but the new addition of a third axis of movement makes it harder to control. Aim correction and leading shots properly are key skills to making this build work, but takes some time to get used to. This build has just enough weight and maneuverability to give it the heft needed to avoid constantly overshooting targets, but not quite enough turning, so you need to be able to instinctively make the call on shots in an instant. Being able to fire significantly faster is still a strong advantage, and nailing consecutive shots does a crap load of damage and it freaks people out. One of my favorite builds. Arm weapons were chosen for pressure and makeshift CIWS ability and power. Cons are the usual. Low KE, still somewhat slow, is very vulnerable to lighter units and getting damage raced. 40 shots is usually not enough to make corrections quick enough to be consistent, which is why I've switched to full power tune. Tolima that has been oriented to purely close quarters combat. 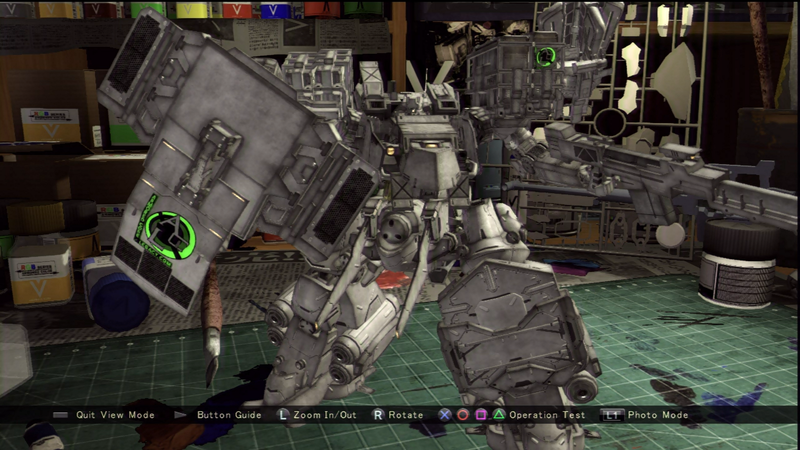 TE Arm type prototype. The theory behind using TE arms is to try maximize firing rate while retaining dual shoulders. While the CE parts are great in that area, they drain almost twice as much as the other two categories of dual shoulders. The lighter dual shoulder TE arms have about the same weight, drain, and AP as the KE versions, but has 8 more firing stability. 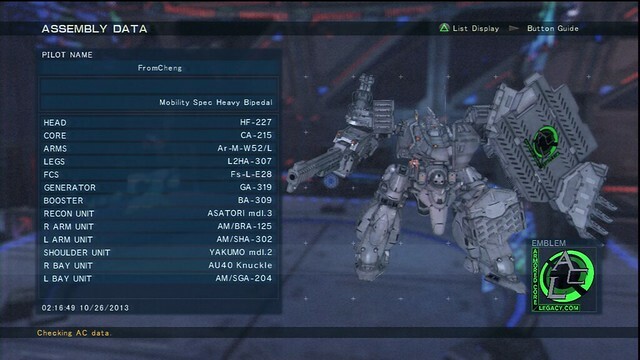 I've chosen weapons such as the Au-C-Bo7 and AM/SGA-108 which have low reload rate to further increase general fire rate. Great for shield breaking and ripping of a couple thousand AP from an AC in a moments notice. Armaments have been chosen based on how well they combo and compliment each other. Shotgun+BR covers most normal heavies and tanks, Shotgun+Pulse hits quads hard, and Shotgun/Pulse/HEAT MG hurts LWs, MWs, and LRJs. 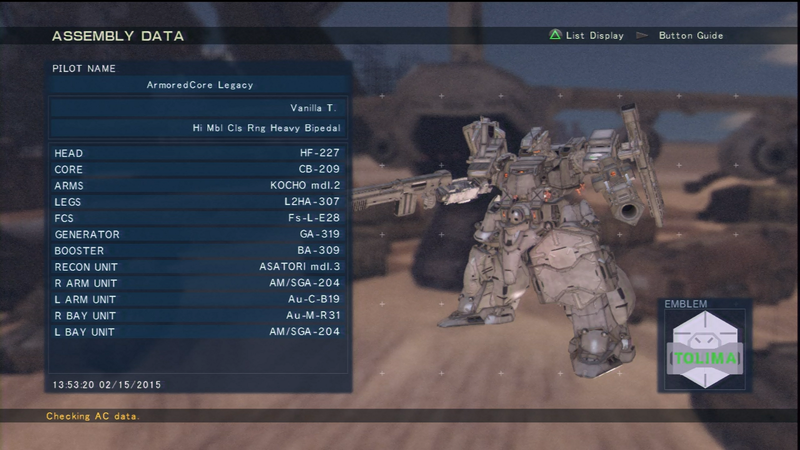 VTFs were added in to increase firepower as a result of focusing on weaponry targeting lighter units in general. Cons are that it still has fairly low fire rate, missiles have a hard time hitting light units, and it doesn't hit the standard 1505 KE defense. Consists of either designs that are no longer used and were failed experiments. 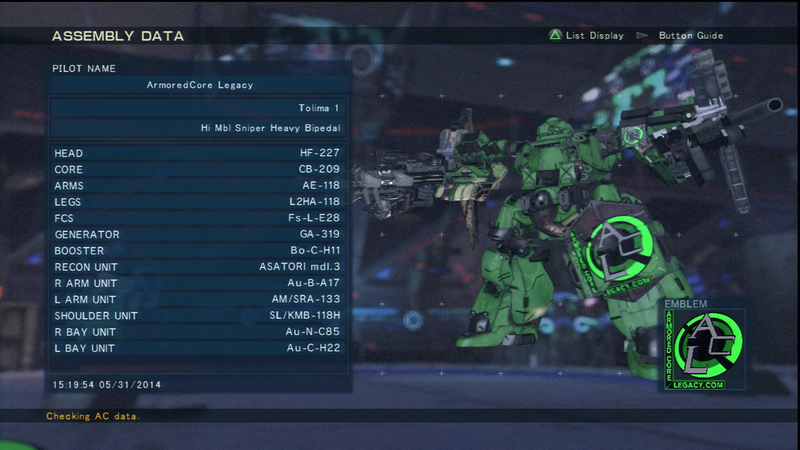 Tolima concept created specifically to buff out CE weapons, mainly the Au-C-H22. Unlike Dun Wadge, I ignored the high AP approach and instead attempted to build the AC without sacrificing too much KE. I managed to get 2050 to completely buff it out (2036 attack power) but was only to get my KE up to 1383. I'm still vulnerable to a full power AM-RFA-222 rifle (1426 attack power, 28 reload), so I do have to be careful, especially when fighting high power rifles or against rifles like the Knave which have high muzzle. 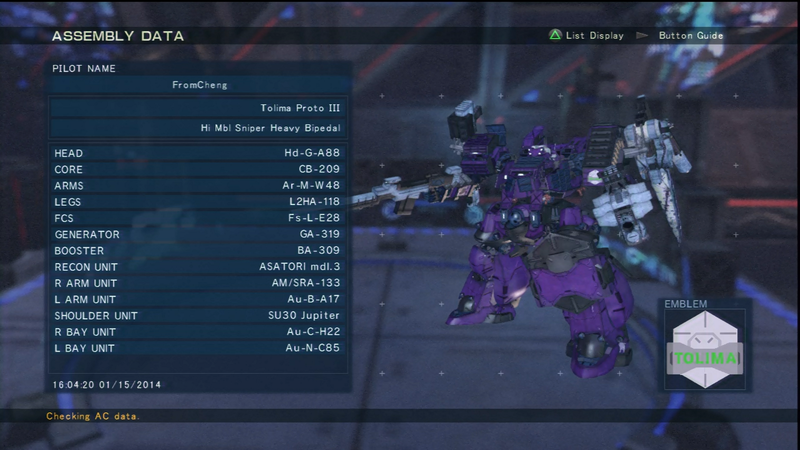 I still haven't figured out a permanent weapon setup but for now I am using the Rolima CQ Ver.3 weapon setup. The only difference other than the weapons being flipped is the addition of the TE missile, Jupiter. The postpatch makes it a much better weapon to use at about the same weight as the AS missile. The VD version of my Tolima from V here (https://www.youtube....h?v=Ib14YjmitRI), designed specifically for close quarters combat. 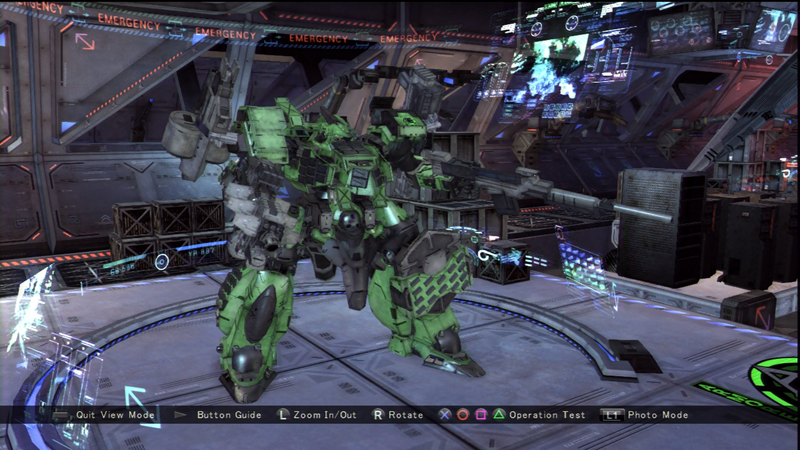 Because the KE arms I used in V lost a significant amount of Firing Stability, I switched over to the shoulder less CE arms instead and equipped a KE head instead. Ironically, my KE defense doesn't hit the 1505 that I originally needed in V (the V version ahd 1484 KE) but since Lamps are easy to outrange in VD, it's not as big of a deal. 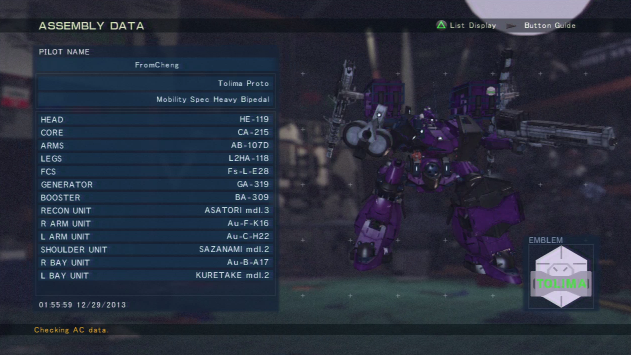 I've considered switching to Tokonatsu boosters for greater speed. Variation of the Vanilla T that focuses purely on speed. As much weight as possible was sacrificed in order to make it quicker and more maneuverable without losing too much AP or defenes, and with it's current setup it maxes at 329 HB. TE arm prototype AC. Created to test another Tolima Design theory. Weapon loadout is designed to hurt low TE builds and plink anything else. Shotgun+Pulse hurts light, quads, and some mids, triple BR + High speed missiles hurts tanks and heavies as well as drop kicks, and the gat is just to harass. I may end up changing the placements of weapons so that the BR combos with the shotgun instead of the gat as an alt. Another design attempting to rethink how I combo my weapons. Switched over to the single shoulder KE arms to bump up KE and get the AP to 35k. Downside is firing stability is still a fairly low 130. Core has been changed to 10/A for little bit more AP and better booster control with energy conductivity. 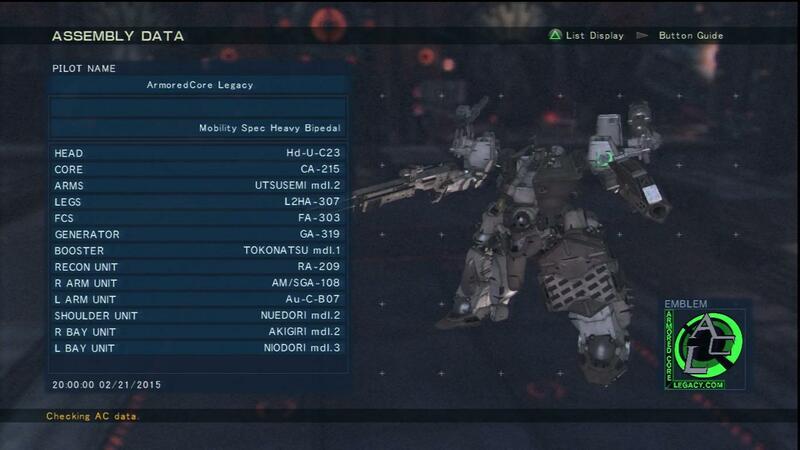 For the legs I switched back to the L2HA-307, the Vanilla Tolima legs, to boost maneuverability. The lower loading capacity made it kind of hard to balance out the weight, so I had to settle for the Dafeng over the Tokonatsu. For weapons, I varied them to see if I could approach damage output for the various weapon types differently. Tansy was chosen for pure power. Lotus was chosen not for full power, but rather full on rapid. My thought on this was twofold: first, most ACs are going to have decent KE anyway, so there's no real point having another rifle as plinking is not as effective for a Tolima based build and 2. While a HEAT machine gun is great for breaking shields and hitting LW units, it requires you to get close and stay on them, which while not too bad for a Tolima based build, is a problem in a team setting where you can't recklessly chase the opponent. To remedy this, I decided to tune so that the BR is more akin to a KE rifle in performance. 1600 attack power means it always hit shields and LWs for effective AND has the bonus of being able to hurt some Mids and really low CE light tanks. 55 reload rate means that it can toss out rounds at a fairly decent rate and 499 muzzle also makes it harder to dodge and makes blue locks easier. PMG was chosen an alternative to dealing with lights but primarily to deal with the problem of low TE quads and maybe the HRJ here and there. 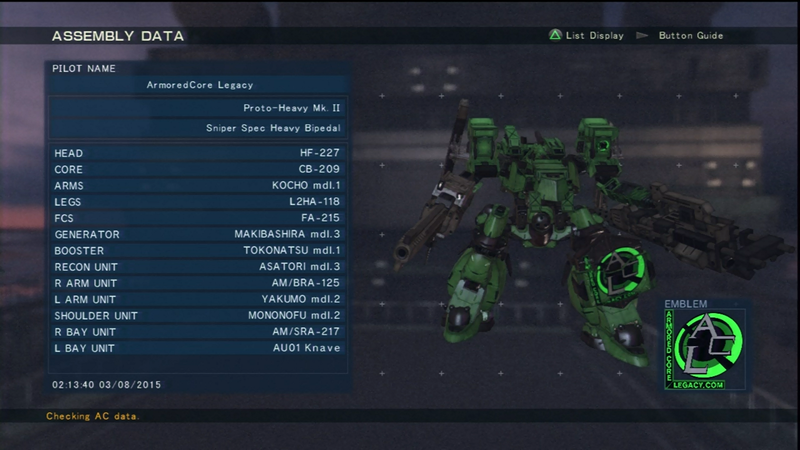 Kurenai mdl.1 is purely to hit heavy units like Fortress Quads and tanks, and the occasional Heavy. Full reload tune to make up for poor firing stability. 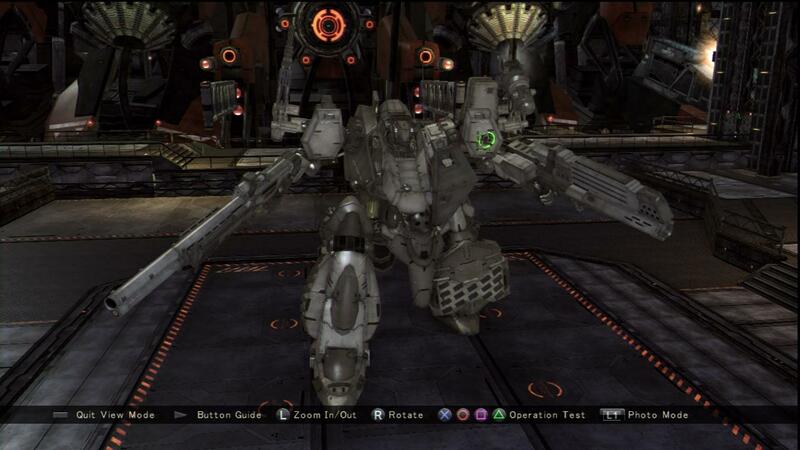 To cover the base in between, I have chosen to equip the the Su-J-G27, the 2325 attack CE power missile. Its uses are limited to close range, but considering most heavies won't be that fast and I'll have the speed advantage, that works perfectly for me. Full lock means that it's hitting like four Cercis BR rounds at once. 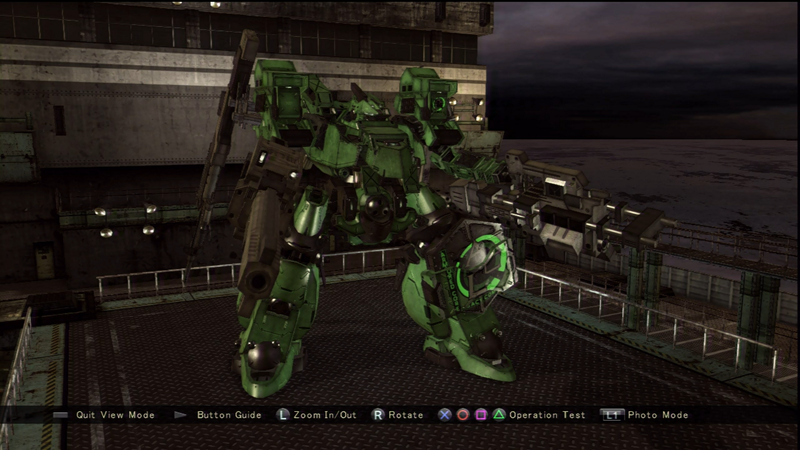 Overall a build based on taking pieces of different design concepts and meshing them together in odd ways. I've yet to gather data for the build but I'll most likely be changing it up more as time progresses. 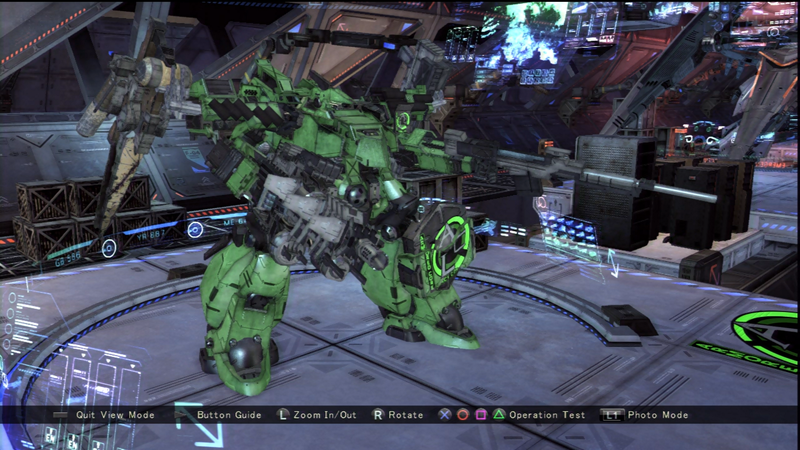 Tolima Prototype oriented toward Armor Break. 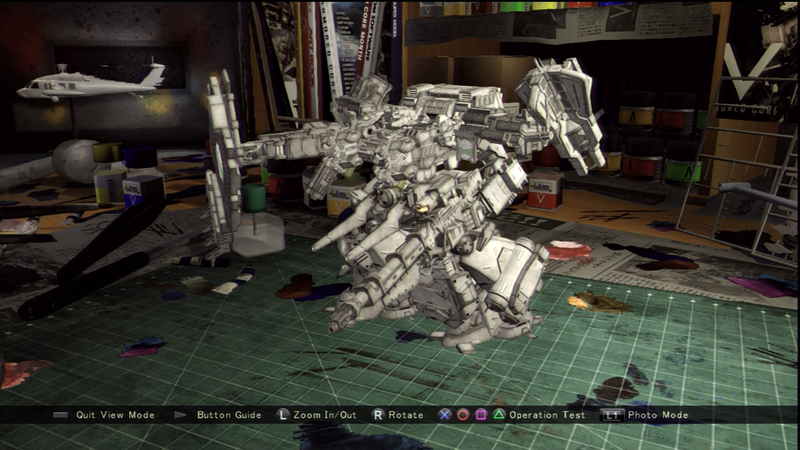 Build testing alternate frame and weapons tunings. Build based off of an old design someone used (Mari?) 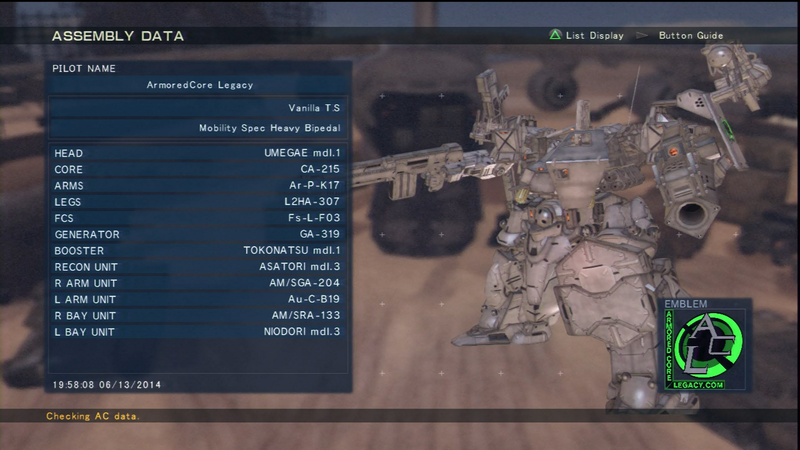 as well as the original Proto-Heavy from ACV. I decided to revist the concept again as I re-examined even more designs. Seidenbaum was chosen as it has similar stats to the Cycad with the only real difference being muzzle. Pros are that it has marginally greater attack power and its impact force also gives it a good chance of stunning MWs and LWs. 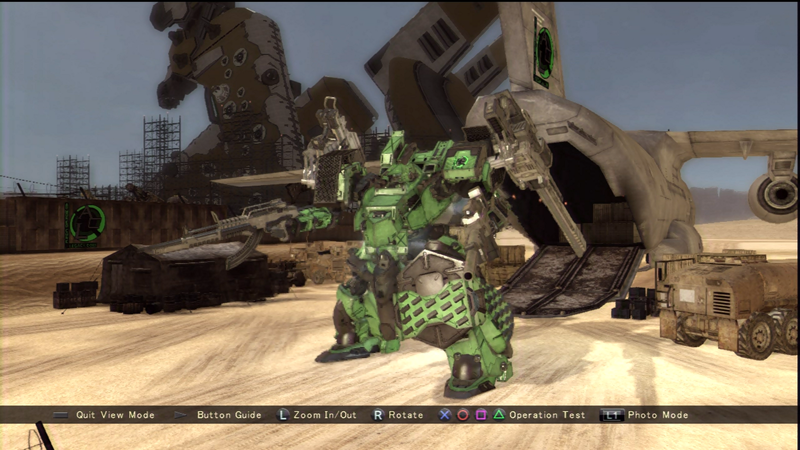 My first attempt to build a "balanced" Tolima frame without using the dual KE shoulders. Defenses are 1505/1784/2439. The newest creation I've made, this frame was created to explore alternative setups. Original idea came from an old prototype design I had in V but never fully explored where I used more TE parts to buff up AP without losing the 1505 KE defense. For this particular design, I decided I wanted more AP but needed to keep at least ~1450 KE and decent fire rate. I chose the A76/L retrofit TE arms because it gave the frame a much needed AP boost to 35k while having 151 firing stability, meaning I'd have good reload on my weapons. I chose to skip the A76 because of the slightly lower defenses/AP and that I didn't feel the 4 extra firing stability was worth it. 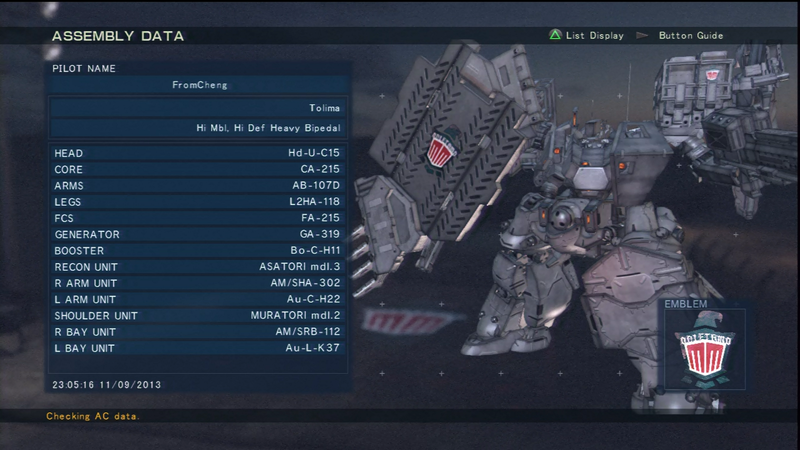 Defenses sit at 1463/1177/2798, meaning I can buff out most rifles except the Lamp and up, and I buff out all CMGs. 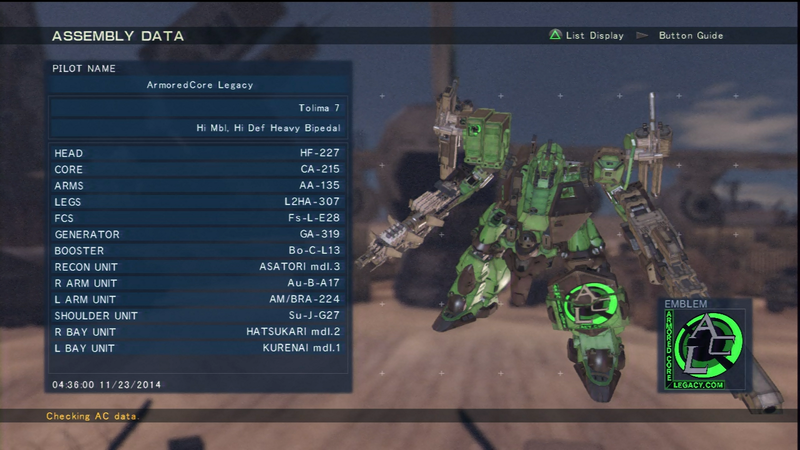 The below pictures shows the AC with the Ver. 1 setup. -Setup was created for plink damage and minor popshotting. 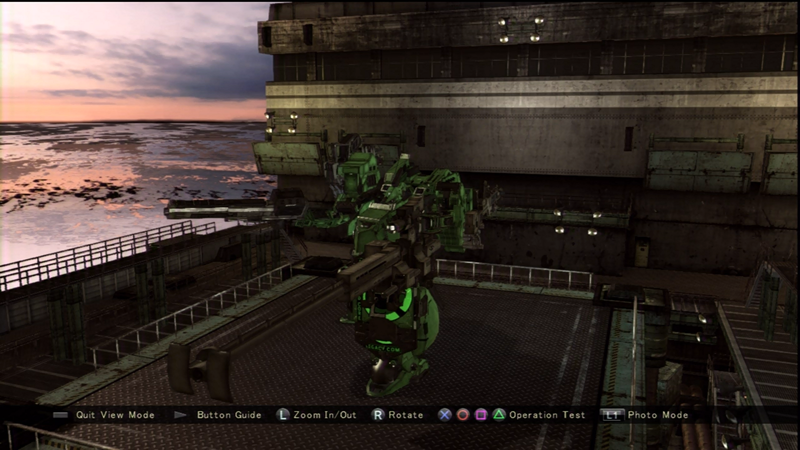 -Setup was designed to be more unorthodox and require better positioning and free aiming. -a revised version of Ver. 1, I focused more on balanced damages. The Tansy and Cycad are meant for effective damage and the AS missiles were meant to make up for the fact that I have difficulty tagging super light weights and RJs so now I don't have to lock on to hit. 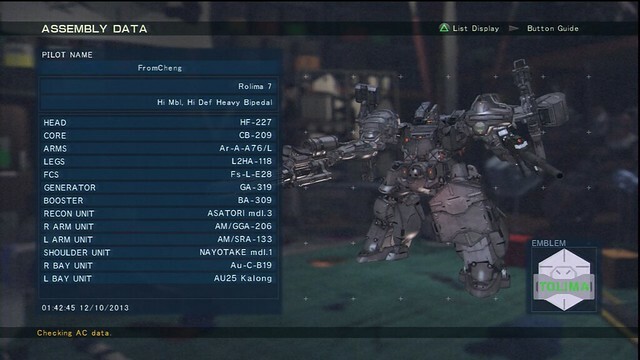 The moonlight was chosen for pure power and to trade with bladers or get some quick damage on tanks or heavies, and the Wakakusa has a dual purpose as a energy sniper rifle (the [1/0/2] tune gives it about 1200-1300 muzzle while retaining 2700 damage and 15 reload) and also as a rapid fire weapon against ACs that get too close. It works well when you spam it on unsuspecting quads. 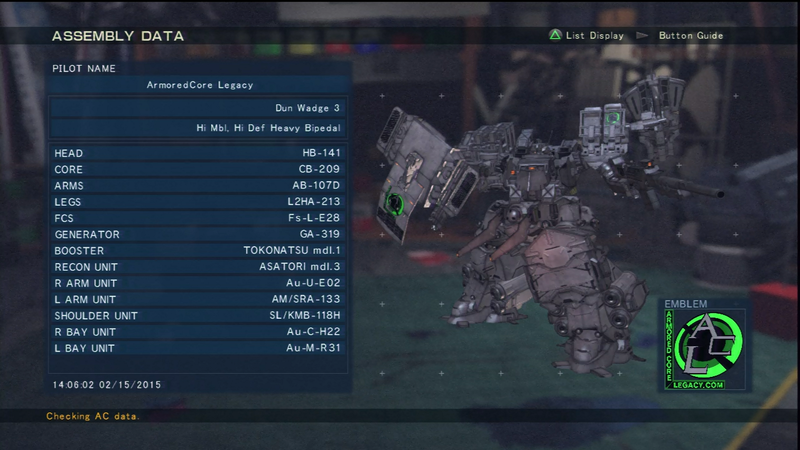 -This setup is a combination of the original Proto-Heavies shotty/BR combo and sniper with missile support. Kuretake mdl. 1 was chosen for its low reload rate (which gets about 190ish when tuned for balanced) and the mdl.2 was chosen more for power. The missiles are meant to supplement the lack of a sub and provides more support. The original concept for my alternative Tolima design, this particular version equips the 199 head, 215 core, and 107 Barry Bull arms to buff up its AP to 37k while maintaining reasonable defenses and speed. The HEAT howitzer was equipped for greater damage over a BR, allowing it to better harm heavies and some quads up close. It's primary weaknesses is its missiles; if someone uses CIWS it loses significant damage potential against faster units. Weapons have not been fully decided yet. Updated with a few more builds, added tunes, and description. the lack of tanks disappoints me. In any case, the High defense shields can soak up more damage than the High AP versions. The only advantage the High AP versions have is they have a better impact resistance stat. +10, Tolima = thug life. Prolima and Brolima are too cool for this thread. Or too hipster. I'm not sure. Forgive me but why are the Tolima Legs your favorite choice in legs? You can't Cheese the legs, only the loadout. If you think you can Cheese a solid Tolima build, you're just going to get outplayed. *Hard-Counter (ACV-VD) : ABSTRACT : Weapon or AC design (or combination thereof) which is conceived specifically to defeat another specific configuration. 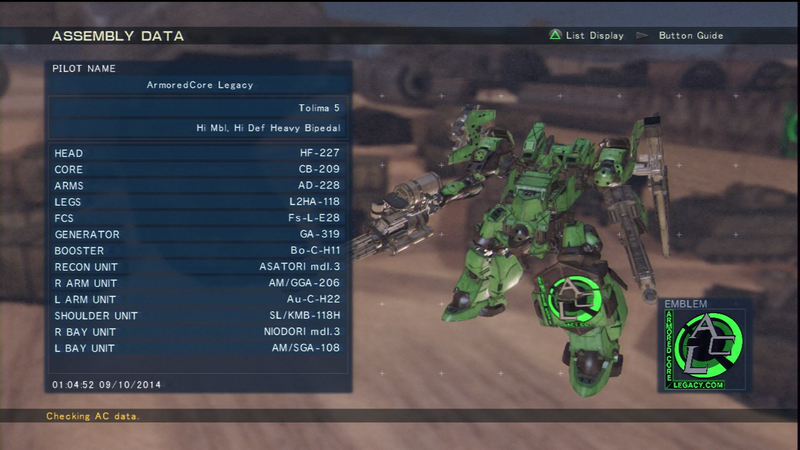 ACVD: Cinto legged Strek Mid. 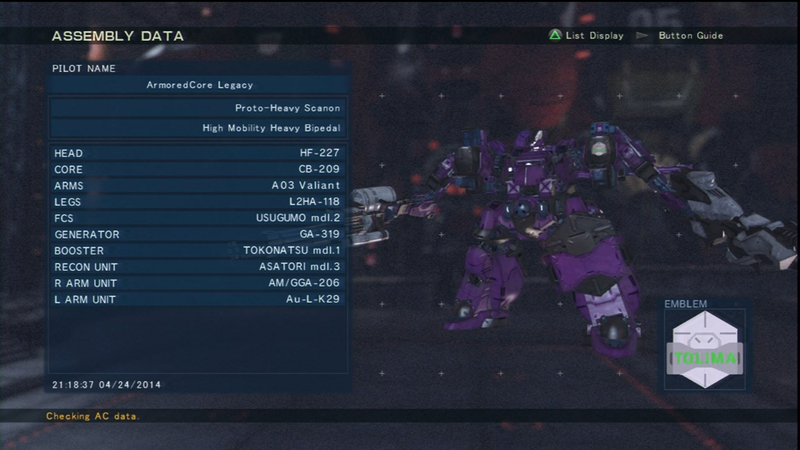 So this is why I've repeatedly almost traded in ACVD despite only having it for a few weeks, such as Dual Amped PMGS that somehow move really well, or "200", rifle range-ish, Piledrivers "Kicking" you from the match. Seriously people, its not "cool", its not "funny", it doesn't involve skill, its downright tryhard-ism and contributes to INT's deadness. This is why we run Tolima. This didn't answer my question. All I read was a long description of how killing people in seconds is considered "Cheesy." I was just asking about the legs. What do these legs hold over others? You can't cheese them. That is why they get use. In other words they perform better than the other legs in every way or just by defense? What do you mean by other legs? Tolima is pretty niche compared to the whole selection, but if you mean as opposed to the other tolima-esque legs, the true Tolima offer the most desirable defense spread in combination with a good balance of mobility and turning. Honestly if some of the other legs just had a bit more KE then I might be saying House ULG-06 instead. 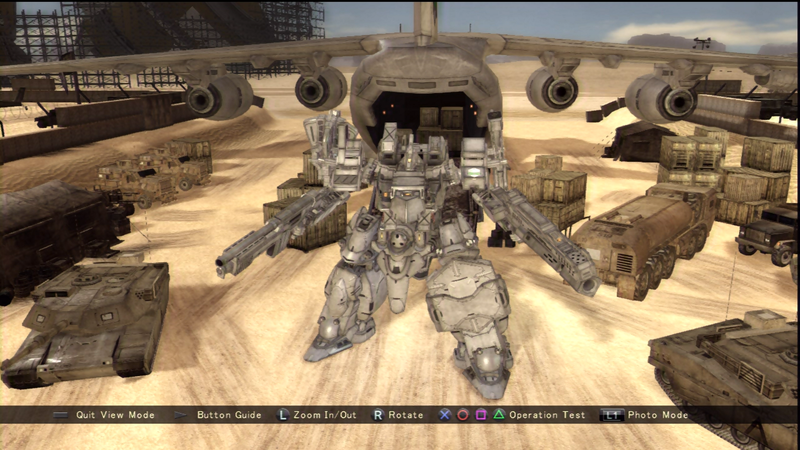 The Tolima branch of legs offer more mobility, similar to a medium, but still have armor values of Heavys (especially the TE Armor). Thats simply it as far as I can tell. The Drawback is they have low AP in comparison to other heavy legs. 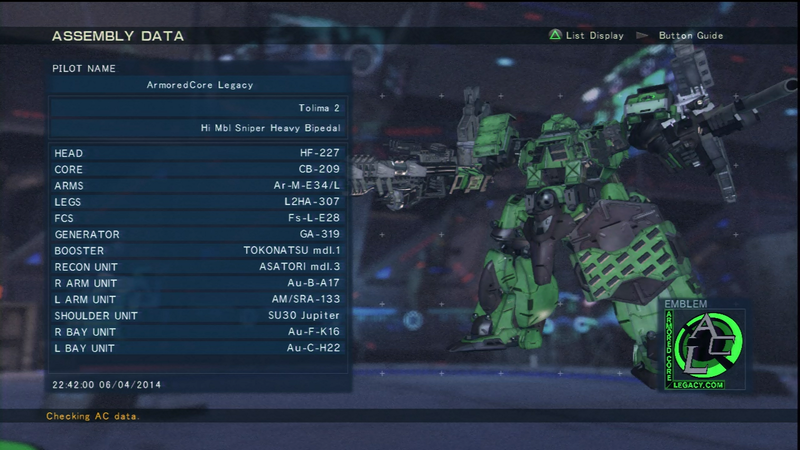 Personally I prefer Aoi 1, but I too have a Tolima build, If I need a heavy with more mobility. Welcome to training cadet. I like to think of this lovely place as my home. Well you wouldn't even think of upsetting me in my home, would you? So do what I say, when I say and I won't get upset. I'll do bad things when I'm upset. 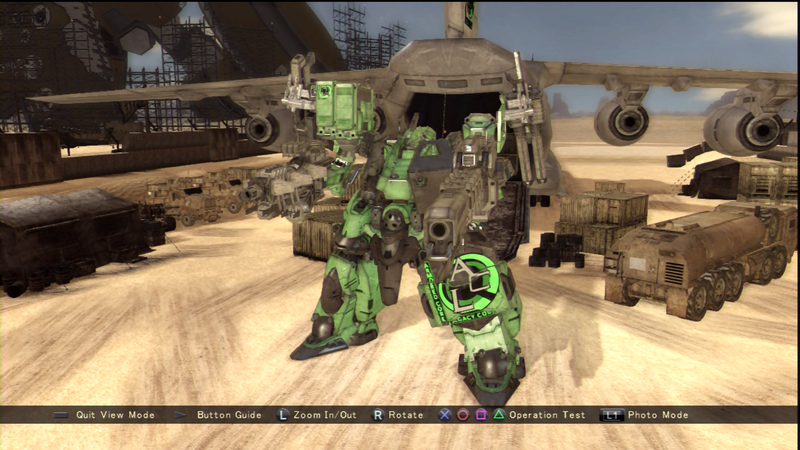 -The most recent setup I've started using and a variation of Ver.2 I've changed the legs to the L2HA-118 (ULG-05/A) for the weight cap and added a Plasma gun and added the Calendula rifle (Au-B-A04). 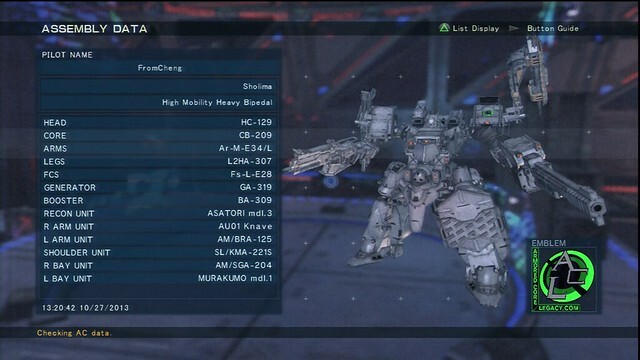 The Plasma gun was added to give me greater ability against heavier units with high AP like fortress quads and tanks, and as a added bonus, I can use it as a CIWS in emergency situations where I have to fight Missile weapon arm users. It's not quite as able as a PMG, but it works, and I can shield fellow ACs as well with its large area. I switched back to a rifle to give me some quick damage output be it ineffective or effective. AS missiles were retained to punish low CE LWs and LRJs and I used the Cycad over the Zlatko due to ammo. 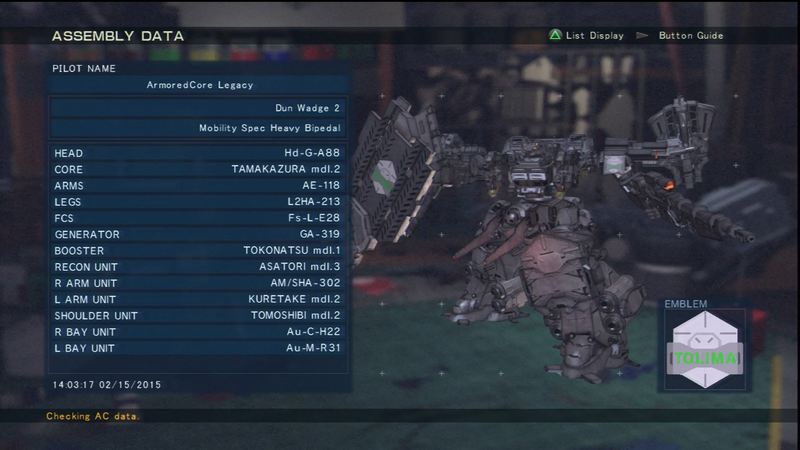 I lose out in having a stagger weapon, but with how bonkers it is in VD, it's not a massive loss. Just out of curiosity: Is this correct, or just a typing error? I assume the latter, cause I don't see a real reason on putting only 1 Tuning point on a weapon. Propably 1 Power and 2 acciracy tuning to improve Muzzle Velo of the Plasma Gun. Have to admit I copied the basic frame, for testing on my one. It looks interesting. I changed the AS Missiles to a Sub Computer though to improve Targeting speed of the Sniper and Rifle. Did also change the Generator to a Suzu, primarily to increase EN Regen and Speed. Maybe I switch them out to Dafeng/Ho Vital for really nice speed increase. I also suggest in changing your FCS for this one. Otkryt doesn't help you much, since you use AS Missiles. The 280 or 350 Range Long Range one seem nice (I use the latter, cause I use a 3/0/0 Tuning for the Sniper for increased Range and Damage). Truth be told, I'm not even sure of the original reason anymore. Maybe I became fascinated with them because of the beatdown Stable (ranked #2 on JP at the time) handed me with his Tolima. Maybe it's because I got bored of midweights and full on heavies and wanted to try something different. At this point, I don't remember, all I know is that I like using them and that is enough reason for me to continue using them. That was indeed a typo. The correct tune is [1/0/2]. I've also used [2/0/0] and [1/1/1] to sacrifice a little bit muzzle for more power. 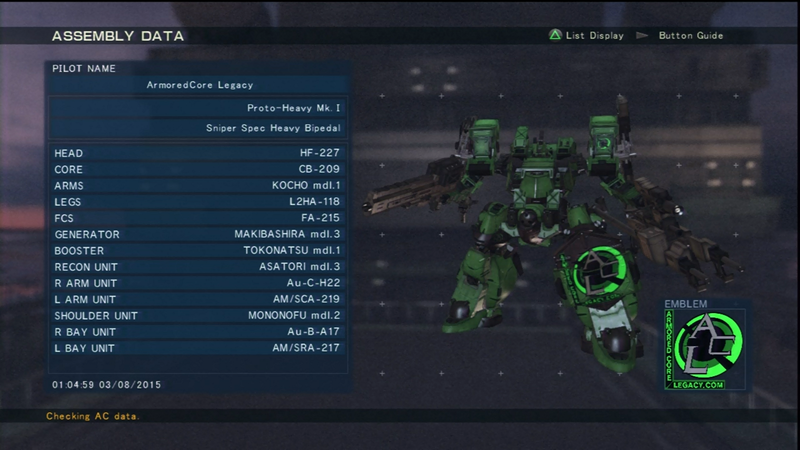 Yeah (1/1/1) is a viable choice for Plasma Guns. Power and Muzzle Increase with reduced Energy Consumption? Why not? I'll have to try that one. I just run it full Accuracy Spec and it nukes quads just fine for my taste.